An instrumental album that got heads turning as Mcenroe continued to impress folks not in the know about his then budding label, Peanuts & Corn Records out of Canada. 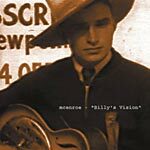 Originally a soundtrack companion piece to Andrew Hunter's art exhibit in Saskatoon and to the book of the same name, Billy's Vision. A nice balancing act of down-tempo and jazz influenced as well as some songs that are a bit more upbeat, in accordance to the particular scenes being described in the book. All songs composed, recorded, produced and mastered by mcenroe. Additional Turntable work by DJ Hunnicutt. Additional vocals by Dominique Reynolds.